Since I took a bit of a blogging hiatus this past summer and fall, I didn't get a chance to share some of my fun trips and activities with you. I figured now that I'm back, I could sprinkle them in here and there, along with what's going on in my life now. So without further adieu, I'd like to share a trip I took with Bryce and his family this past fall! 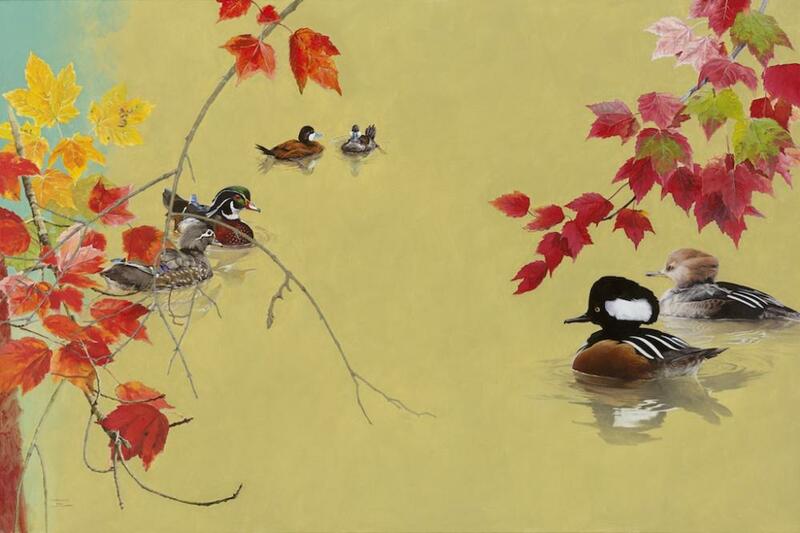 In November, we traveled to the charming Easton, Maryland for their annual Waterfowl Festival. Located on the Eastern Shore of Maryland, the Festival is an integral part of the community. The Festival brings together waterfowl enthusiasts and involves art galleries, decoy artists, retriever demonstrations, historical information, and more! We were there Thursday night through Sunday and had lots of fun! All the shops and storefronts in the town went ducky (or goosey!) for the Festival. Bryce enjoying a camo cupcake! There were lots of dogs. I loved the retriever demonstrations! There were activities and events for kids. This robot even talks to you! There was lots of shopping in both Easton and nearby St. Michael's. Isn't this dressing room adorable? And lots of good food! And finally, beautiful art everywhere! My biggest purchase of the weekend was this oil painting by St. Michael's artist Barbara Jablin! Have you ever been to Maryland's Eastern Shore? I actually went to this festival about 9 years ago for work. I was scoping out artists/art for my job. Such a great time/city. I adore your cow painting. I went to the festival this year! However, I got there a little too late on Sunday and everything was basically closing up. it was so upsetting. I will be going back again! Great event...as a duck hunter I try to make it every year. Glad Bryce made you take the trip! This looks like so much fun! I'm always amazed at the adorable towns and culture on the east coast. They have so much history and their own flavor. The west coast is so much newer, our little towns just don't have the same charm and character (in my opinion...:)) I'm in DC on Tuesday/Wednesday this week but it's only for 24 hours so an interview so no time for a meet up. Soon enough though and I'll write you back soon too! I love reading about vacation spots. Gives me ideas :) Keep them coming! I've not been there. Looks lovely. I'll take some of that crab soup! Zach and I took our first weekend getaway as a couple to St Michaels. We loved it. Now that we are moving back to Va, I wanna go back and check out this festival.